Nature Reporters: County record butterflies! Late last week I received 2 emails from local butterfly enthusiasts who had seen the butterfly gallery on my website. They mentioned that I had a couple of butterflies that had not been documented from my county (Anderson) and that I should contact the Butterflies and Moths of North America (BAMONA) coordinator for Tennessee. 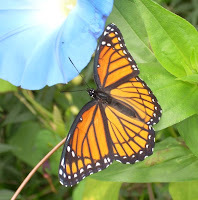 I sent the photos for verification along with the link to my Butterfly gallery. I was thrilled when Steve Stedman wrote back and said he had found 7 county record butterflies on my gallery! It is good that I had documented the date and location of where I saw each of the butterflies! On the subject of flowers --- despite the bitter cold and torrential rains we have been experiencing, I found my first Snow Crocus blooming in my yard on Jan. 18!